It wasn't just the sharemarket that was affected - the crisis in business and lender confidence pulled the booming property market off its tracks. Mortgagee auctions and forced sales, bankruptcies and prosecutions followed as many formerly respected business figures fell from grace - breaking the faith of investors all over the world. Lost Property is a searingly honest insider's account of the build-up and the let-down, with its brutal aftermath. Read this book to learn what happened during the boom and the crash, how they came about and why. Olly Newland's first-hand narrative is full of insights and parallels which today's investor would be wise to consider. Ignore these lessons at your peril! "Many people remember with a shudder the massive stockmarket crash around the world in 1987. In New Zealand, as in many countries, it came on the back of an unprecedented share and property boom when huge sums of money could be made for the asking. Here, Olly Newland gives an insider's view of the build-up and the let-down -- and lays the blame firmly at the doors of the banks and the government. Readers may never trust either again. In this special edition, released for the 20th anniversary of the 1987 crash, Olly Newland reflects on how much - and how little - has changed since then. He shares valuable insights into the crash, drawing lessons from his own and others' experiences in those frenetic days. 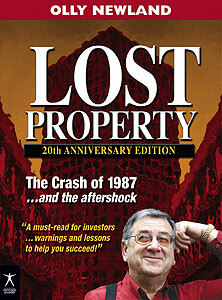 Lost Property offers practical, timeless advice about building wealth and ongoing income from investment."